Taking a break from all the iOS 7 hubbub, I came across this trailer for an upcoming animated series from the Rooster Teeth Network called RWBY. I think it looks pretty amazing, and it should. The man behind it is none other than Monty Oum, whose work on Red vs. Blue: Revelation and Dead Fantasy pretty much defined what this kind of animation can be. 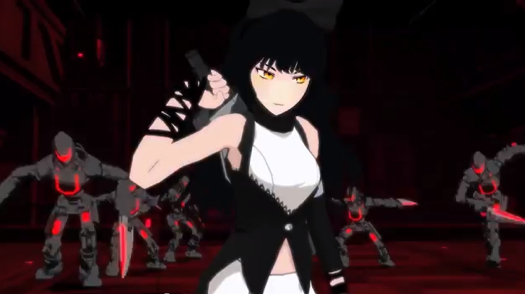 But don’t take my word for it, check out the RWBY trailer called “Black” right here. Is this the future of animation? It just may be. This entry was posted in Animation, Art, Cool Stuff, Geek, Trailers, Video and tagged Animation, Anime, Dead Fantasy, Haloid, Machinima, Monty Oum, Rooster Teeth, RWBY, Trailers, YouTube. Bookmark the permalink. 9 Responses to Is ‘RWBY’ the Future of Animation? This show is terrible. The idea is idiotic. The animation is sad. All of the voice acting is horrible. They need to scrap this whole thing before it ruins Rooster Teeth. Please, do the world a favor, NEVER allow those people to voice anything EVER! Just terrible! Interesting perspective. Thanks for the comment. I guess we’ll see how it goes for the show and for Rooster Teeth. Sadly I have to agree with Adam. The show is honestly only popular thanks to all the fans from other Rossterteeth shows. If it had nothing to do with Roosterteeth this show would a Catastrophic failure. You could be right, but we will never know for sure. However, I do really enjoy it and, in particular, the look of the animation. So I’ll keep watching as long as they keep making it. This is utter crap. Terrible animation… geez! You, of course, have a right to your opinion. I don’t agree, but that’s how it goes. Thanks for the comment either way. Well. Months on from that, I would say that the animation is improving more and more, and that RWBY hasn’t ruined RoosterTeeth. RWBY has become a very worthy success for them. The good news about season 3 is that it introduces an exciting development.